AFC manufactures, markets and sells worldwide satellite dish antennas, conical horn antennas, radomes, antenna feeds, microwave and waveguide components, ultra-low transmission loss waveguide called Tallguide ®, and custom shelters. Company and product information is available within AFC’s Company Profile. Announcements on AFC’s major military and commercial contracts, projects and awards are found in the Press Releases section. AFC’s customers serve the satellite, broadcast, communications, radar, weather and cable industry, defense, government, and government agencies worldwide. AFC’s quality control manufacturing standards are certified under ISO9001:2008. AFC is a world leader in the design and manufacture of high surface accuracy terrestrial and satellite communications antennas. 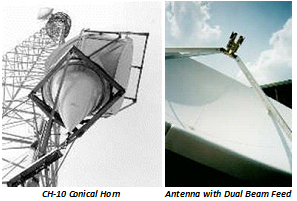 Patterning its terrestrial microwave point-to-point conical horn antenna product line after the highly successful Telstar horn developed by Bell Laboratories, AFC pioneered a complete line of highly precise, dimensionally stable composite fiberglass antennas in various sizes for frequency coverage through 40 Ghz. This technology has also been applied to AFC’s line of parabolic dish antennas. Parabolic antennas come with various Az/El, polar, hand-crank or motorized pedestals. Antenna options include cored ultra light reflectors, offset, embedded wire anti-ice or transportable systems and feeds for GOES, Intelsat, Receive/Transmit, Receive Only, Multi-satellite, International or FCC specified applications. Satellite antenna sizes and models are found in the table. Specific information on AFC’s line of high wind fixed pointing satellite dish antennas may be found in 2.4 to 7 Meter Satellite Az/El Mount Antennas. For general broadcasting and cable television satellite reception, AFC’s Galaxy series 3.7 meter satellite dish antenna provides an easy to install economic solution. “Competing Antenna Requirements for Dual-Band Satellites”, reprinted from the March 1994 CED magazine, takes a look at the four alternative antenna configurations which dominate earth stations for dual C/Ku-band satellites. And in high terrestrial interference areas, where satellite dish antennas fail to work, AFC offers the CH-14, the world largest commercial conical horn. The CH-14 horn exhibits very sharp spatial selectivity, grabbing signals from a specific pointing direction and rejecting others. Today, AFC offers a line of totally unique terrestrial and satellite communications antennas designed for the highest levels of performance, extreme durability and low delivery and maintenance costs. In support of the antenna industry, AFC offers a broad range of microwave components, combining networks, antenna feeds, multi-satellite feeds, orthomode polarizers, launchers and ultra-low loss waveguide. Manufacturing techniques employed are aimed at achieving desired technical results and cost objectives for commercial and military/agency applications. Frequency bands covered are up to 100 Ghz. The Satellite Communications Antenna Feeds data sheet contains information on commonly purchased feed types. Multi-Sat Feed for Two-Degree Spaced Satellites describes a class of multi-beam feed systems specifically designed for 4.5 to 9 meter diameter antennas. For smaller antennas, see Dual Beam Retrofit Multi-Satellite Feed for 3.7 m (12 ft.) Diameter Class Antennas. Design and technical information, installation and test results may be found in Multi-satellite feed system for 2-degree satellite spacing reprinted from the April 1992 CED magazine. AFC’s high technology radome capability combines the expertise of materials science, geodesic domes, structures and electromagnetics. AFC manufactures four types of dielectric Radomes. The four types identify themselves primarily by the radome wall construction. In each case, the dielectric panel edges are reinforced into flanges for adjacent panel assembly. The dielectric flanges form a framework establishing the general terminology Dielectric Space Frame (DSF) for AFC’s radome products. Depending on radome wall parameters, adjacent panel flanges may also serve as environmental load bearing beams or struts. Each panel is a molded one piece unit. When assembled to the other panels, the panel array forms a truncated spherical surface. Individual panels may be doubly curved or flat yielding a faceted or spherically smooth appearance. Foam insulation is often added to the wall producing a two or three layer sandwich configuration. Radome transmission loss is composed of the insertion loss from the RF signal passing through the radome wall and from the scattering loss off the panel flange framework. In most cases, the scattering loss from the framework is several times greater than the wall insertion loss. To reduce scattering loss, AFC engineers use a technique known as impedance matching to “tune out” framework loss. As required by sophisticated electrical performance requirements, inductive elements (wire, metallic strips etc.) may be laminated into the dielectric flanges to impedance match scattering loss. Any of the four DSF radome types may be impedance matched. Please refer to the Radome Network Home Page for more information on impedance matched radomes. Every DSF radome exhibits the RF property that the total transmission loss, scattering plus wall insertion loss, approaches zero dB at low frequencies (as opposed to “Metal Space Frame Radomes” whose loss increases without limit. This property is important for UHF/VHF emergency radio communications contained within the radome). The superior performance and Advantages of Dielectric Radome Technology are evident in the worldwide Defense Satellite Communications System (DSCS), weather satellite and radar, air surveillance radar and Intelsat Communications applications. The thin membrane wall DSF radome where adjacent panel flanges carry all the environmental loads. Wall thickness is usually 0.040 inch or less. The solid laminate wall DSF radome. Wall thickness is typically 0.090 inch. Adding a layer of foam to the inside thin membrane wall DSF radome forms a 2-layer sandwich wall radome. Foam thickness is chosen primarily for thermal insulation and cost objectives. 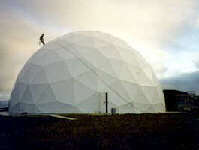 The composite 3-layer sandwich foam core wall radome. Core thickness is chosen as 1/4 wavelength for the highest RF signal frequency. For a given radome diameter, the 3-layer sandwich foam core radome is the most expensive version. For more sandwich wall details, AFC’s Application Note for Radome Thermal Insulation discusses two and three multi-layer sandwich wall Radomes and their significant insulation value differences. AFC engineers have developed a family of dielectric space frame Radomes based on a range of required radome diameters. A set of Radomes within a given range of radii will have identical panel count, panel shape and overall geometric layout. Individual panel size and the flange angles, which are radius dependent, will differ to accommodate the radome’s overall shape factors. Spherical truncation is also radome specific, and is accommodated by sub panels unique to each requirement. This process of engineering complex designs from the macro point of view has greatly simplified the structural design phase. Emphasis is placed on meeting the material strength requirements of the environmental specifications and of the important electromagnetic constraints as opposed to continually reinventing the radome. 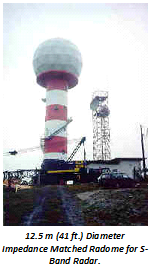 Radome accessories customize a radome to suit particular requirements. Accessories may include lightning protection, obstruction lights, ventilation, base collar, personnel door, indoor lights and power kits, hydrophobic coating and impedance matching. For more information, visit AFC’s Dielectric Space Frame Radome data sheets, Radome Capability. 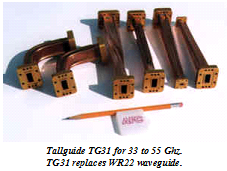 Ultra low loss Tallguide (TALLGUIDE ®) is a unique form of precision rectangular waveguide that exhibits one tenth (1/10) the transmission line loss of standard WR type waveguide. Tallguide’s virtual loss free transmission mode appeals to multi-mode waveguide technology where as many as 15 higher order modes may propagate. See Tallguide ® Loss Savings Compared with Standard Waveguide for detailed graphical information over the 5 to 110 Ghz frequency band. Tallguide has all necessary bends, twists and straight sections that are essential to lay out any waveguide run. A Tallguide run consist of transition units from standard waveguide into Tallguide, H-plane bends, twists, straight sections and mode suppressor in-between. Tallguide enables the interfacility waveguide run distance, between the control room and transmitting antenna, to be specified for convenience. Typical applications are satellite uplinks and radar. For example, the ASDE 3 short pulse airport surveillance radar, uses Tallguide at most major airports within the US, Canada and Europe. Often, ASDE 3 Tallguide runs are several hundred feet long. For satellite communications applications, Tallguide increases uplink power — significantly reducing earth station cost. For further satellite communications data, see How to Combat Uplink Power Loss reprinted from the January 1995 issue of Satellite Communications. AFC manufactures custom shelters to solve a variety of needs. Typical examples are transportable uplinks and secure airborne deliverable shelter modules. In todays tactical, highly mobile atmosphere, shelters often encompass dual use roles. Such tactical applications include an airborne deployed environmentally controlled 8x8x20 foot shelter housing a complete 26 foot diameter radome. Accessories and optional features may include TEMPEST design, personnel and equipment doors, alarm and emergency systems.